Lutong Bahay will be a short tag on the title which I'll use to feature home-cooked food, either in our own home or at a friend's house. Yesterday was my sister's 17th birthday. And to deviate from the usual meal celebrations, my little sister just wanted some home-made Special Empanada (meat pie) to give to her friends. This batch of Special Empanada is made by our dearest dad. Using a recipe handed down for generations, it is the meatiest, juiciest and crunchiest meat pie I had ever tasted. 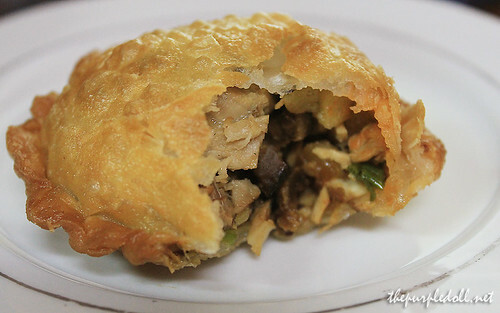 Inside the special crust are the oozing meat fillings -- pork, shrimp, mushrooms, potatoes and veggies. And although I'm not a big meat pie eater, I can't get enough of my dad's very filling Special Empanada which usually replaces my lunch and even dinner. How about you, do you have any family-handed down recipes? Omi!! I love empanadas! Those look delish. I want to learn how to cook one. saraaaaaaap. i love meat pies!!! This reminded me of yesterdays craving. 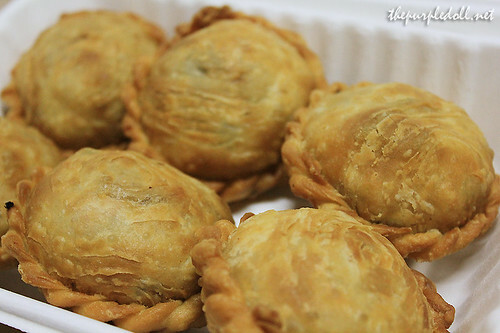 i wanna eat empanada, with that fillings! shrimps beef egg and mushrooms. Oh wow... I'm very choosy when it comes to empanadas since I'm very particular about the filling. But the way you photograph and describe your dad's empanada makes it really enticing. My sister and I love to cook but we take after our mom... my dad can't even cook to save his life. Hehe! ang sarap tignan! natakam din aku!